Since graduating from the Slade School of Fine Art, London in 1981 Andrew Folan has practised in print, photography and sculpture. Recent works have combined digital processes and print in multi-layered composite photo-montage. He is an active collaborator in scientific, medical and architectural projects and participated in the Digital Surface presented at Tate Britain (2003). Essentially a conceptual artist, Folan has more recently explored concerns of a social, psychological and scientific nature. While he is concerned with issue based reasoning, process is always an important component and his productions are usually delivered in a formalist and often highly labour intensive manner. He has exhibited widely throughout Europe. His solo exhibition of printed sculptures Arterial Ink toured to a number of venues in Ireland as well as London, Paris and Stockholm (1991-2001). His solo exhibition of digital lambdachromes Stray Light was shown at the Ashford Gallery, Dublin in 2002. He participated in a group exhibition Dead Bodies at the Centre Culturel Irlandais, Paris in 2003. In 2006 he completed a sculptural installation The Fleet Morph at the Mater Hospital Dublin. In 2008 he completed a commission Anatomy of an Instrument for the Royal Victoria Hospital, Belfast, using CT scanning as the central research component. He presented a paper, Grasping the Untouchable at The International Symposium on Electronic Art, Belfast, 2009. 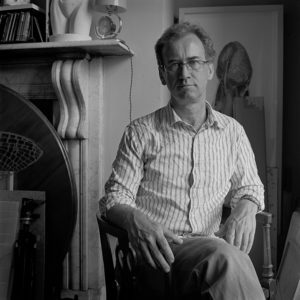 His work is the collections of the Arts Council, Dublin, The Irish Museum of Modern Art, The Central Bank of Ireland and Trinity College, Dublin.